This paper reports the southernmost record of Camacho faroensis Myers, 1998 (Crustacea: Amphipoda: Aoridae) from samples collected at the continental slope (Ferrol Canyon) off the NW Iberian Peninsula during the DIVA-Artabria I expeditions. This species was initially described from the Faroe Islands but type specimens are incomplete and lack relevant features (e.g., antenna 1, pereopod 5). Therefore, a detailed redescription and drawings are provided based on examination of the type series and the new material collected. To date, the genus Camacho Stebbing, 1888 is composed of three species being C. faroensis as the only one reported so far from the Northern Hemisphere. This species is characterized by the following characters: absence of eyes, cephalic lobes reduced, presence of two ventral spines on peduncle article 1 distal margin of antenna 1, presence of spines (stout setae) on pereopods 5–7, reduced inner rami of uropod 3, and lacking distal setae. A key for all recognized species of the genus is also included. 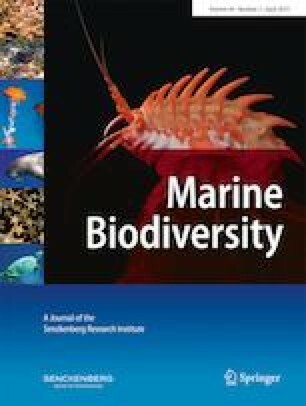 The authors are grateful to the crew of the R/V Mytilus (Consejo Superior de Investigaciones Científicas [CSIC] Spain), to the staff of the Estación de Bioloxía Mariña da Graña (Universidad de Santiago de Compostela) who sorted the samples, and to the staff of the Zoological Museum of Copenhagen (ZMUC) and Museo de Historia Natural of the Universidad de Santiago de Compostela (MHNUSC) for loaning of specimens. The authors also want to thank the comments of three anonymous reviewers who helped to vastly improve this work. This work is a contribution of the following projects: PGIDT01PXI20008PR, PGIDIT05PXIC20001P, PGIDIT07PXB000120PR, A Selva-08, and ForSaGal-09 financed by the Dirección Xeral (I + D + i) from the Xunta de Galicia, and VEM2003-20070-C04-04, CGL2004-22429-E, and CTM2004-00740 financed by the Ministerio de Educación y Ciencia (Spain). All applicable, national, and/or institutional guidelines for the care and use of animals were followed. All necessary permits for sampling and observational field studies have been obtained by the authors from the competent authorities and are mentioned in the acknowledgements, if applicable.